George Stanley Halas, born to resourceful Bohemian immigrants, and whose initials will forever be emblazoned on the left sleeve of the Chicago Bears uniform, played a large role in defining Sunday afternoons in America throughout the 20th and 21st centuries. Halas was born in Chicago in 1895, and learned self-discipline, business smarts and frugality through his family. After saving his money carefully, he attended the University of Illinois in Urbana-Champaign, playing football, baseball and basketball and joining Tau Kappa Epsilon fraternity with his older brother. A very interesting and notable story about Halas from this era is a legend, and may or may not be true. Working for Western Electric in Chicago's near west suburbs, Halas planned on embarking on the S.S. Eastland for a weekend company outing. In his biography, Halas claimed that he just missed the ship, which capsized in the Chicago River, killing 845 people. Others have claimed Halas overslept, which of course would be contrary to Halas' notoriety for hard work. Prior to his final semester at Illinois, the United States entered the Great War (World War 1), and Halas enlisted in the United States Navy. He would later be awarded his college diploma despite not finishing all required coursework. Halas was assigned to Great Lakes Naval Base and ordered to organize great US Service teams in football and basketball. Following his first stint in the Navy, Halas gained a roster spot with the New York Yankees in 1919, but his failure to hit the curve ball ended that career almost before it started. The only permanent memory he would have from his Yankee career was a bum hip he injured sliding into a base. After his baseball career ended, Halas returned to the Chicago area and found himself working for a railroad designing bridges, honoring his civil engineering degree. He promised his mother that he was finished playing sports and would settle down into a real career, but at the same time snuck off to play football for club teams on weekends. Recommended by contacts from Illinois, and based on his reputation organizing the military service sports teams, Halas in early 1920 received a call from the Staley Starch Works, based in Decatur, IL. The Staley company wondered if Halas would relocate to that central Illinois city to work at the company, as well as organize and coach the company's football and baseball teams. Halas jumped at the opportunity. The new manager and coach of the Decatur Staleys, and his partner Ed "Dutch" Sternaman, decided it would be best to attend an organizational meeting of other club team owners that September in Canton, OH. The group formed the rudimentary structure of the American Professional Football Association, to be renamed the National Football League in 1924. Following a successful 1920 season, A.E. Staley met with Halas in Decatur, and told the young coach of his team that unfortunately he didn't think a professional football team could survive in Decatur. Take your team to Chicago, young man, Staley said. He offered Halas $5,000 to get started in exchange for keeping the team named the Staleys for one season. Halas indeed moved the team to Chicago, and thanks to the goodwill of Chicago Cubs owner William Veeck Sr., the Chicago Staleys began a 70-year run of sharing Wrigley Field for a portion of the gate, concessions and program sales. Feeling somewhat in debt to Veeck, in 1922 Halas renamed the Staleys the Bears, in honor of the Cubs. Halas fought hard for his fledgling league and team throughout the years. In the mid-1920's, Halas signed young, phenomenal running back Red Grange from his Alma Mater Illinois, and with Grange organized a nationwide "barnstorming" tour to bring professional football to the masses. Not only was Halas coaching and running the business side of the Bears, he also played various positions with the team, until finally retiring as a player after the 1929 season. In 1930, he and his partner Sternaman turned the team over to a new Head Coach, Ralph Jones, who secured a league championship in his third year. Halas would return as head coach after the 1932 championship season, and at the same time barely won a battle with Sternaman to retain ownership of the team. Halas' 1933 team won another world championship, dominating the league at this time, and by the end of the decade was forced to retool again. His teams won NFL Championships again in 1940 and 1941, just as Halas re-enlisted in the Navy following the attack on Pearl Harbor. During World War II, Halas spent three years in the South Pacific with the Navy, mainly organizing R&R and entertainment for weary troops. While he was away the Bears, coached by Luke Johnsos and Hunk Anderson, won another title in 1943. 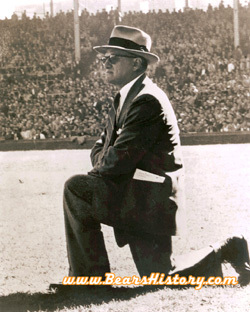 Halas returned at the end of the 1945 season, and led his club to a final championship of the decade in 1946. While the Bears of the 1950's won no championships, this decade may have been the most critical to the Halas legend. Halas had an intriguing and multi-faceted personality. A devout family and religious man who publicly swore off drinking and tobacco, on the field was said by many to have the filthiest mouth of any man they'd ever heard. He routinely cussed referees and made them pick their game salary off the ground a dollar at a time when he paid them following games. This shrewd businessman also cautiously and successfully led the NFL into the lucrative television era, finally ensuring the success of the league when for so long that prospect was tenuous at best. "Papa Bear" retired from coaching the Bears in 1955, handing the reigns over to longtime friend and assistant Paddy Driscoll prior to the 1956 season. But after just two years (of meddling on the sidelines), Halas returned as Head Coach, looking for one more elusive championship. He got that championship in 1963, after rebuilding his team one more time. Following that 1963 championship, his teams couldn't reach the pinnacle again due more to circumstance than his control. He finally relinquished the head coaching reigns of the team prior to the 1968 season to assistant Jim Dooley, explaining that he knew it was time to go since he couldn't chase refs fast enough to cuss them out anymore. Halas had worked his son George Jr. "Mugs" into the role of team president, and the senior flew to England for a long-overdue hip replacement. The 1970's were a time for the elder Halas to try to enjoy life while loosely keeping watch over the team and league he grew and groomed to success. In 1975, his son Mugs did the unthinkable, convincing his father to hire General Manager Jim Finks to control all day-to-day operations of the club. This move provided modest success as the Bears made the playoffs for the first time since 1963 in 1977. Halas Sr. thought things were in fairly good hands until just after midnight on the morning of December 16th, 1979. That morning, Halas learned that his only son "Mugs" had died of a heart attack at the young age of 54. Halas' life was turned upside down, and soon he would re-enter the Bears with renewed vigor. Halas endured two more full seasons of Finks and the General Manager's coach in Neill Armstrong, but by the failing 1981 season Halas had had enough. The 86-year old patriarch of the team began attending practices, and even forced Armstrong to hire Dooley as an assistant, so Dooley could give Halas secret updates on what was going on with the team. By the end of that year, Halas had completely usurped Finks' authority, and hired Mike Ditka as his new head coach without so much as consulting his General Manager. With the hiring of Ditka, and the elevation of team accountant Jerry Vainisi to GM after Finks' resignation in 1983, Halas had assembled the men he wanted to run his team into the future. In his final years, Halas kept to a rigorous schedule in the office that included sharing old stories over wine with Vainisi and others, then daily dinners with Illinois notables each evening. He and his family vigorously guarded the news that he was diagnosed with pancreatic cancer in early 1983, bringing a fair amount of shock to the Chicago area when he passed away that October 31st. Whether the National Football League would have been founded and prospered without George Halas is up to debate. But George Halas being the heart and soul of the Chicago Bears and the league during many of its critical moments, is not. Although George S. Halas "officially" retired from the Bears after the 1967 football season, he was far from done. He kept an office at Bears headquarters, and took back over presidency of the team following his son Mugs' untimely death in 1979. Halas was born in Chicago and attended the University of Illinois. He served in the military during both World War I and World War II. George and Min Halas had two children. Daughter Virginia was born in 1923, son George S. "Mugs" Jr. in 1925. Due to complications after Mugs' birth, the couple were not able to have more children. Halas and his assistants, most notably Ralph Jones, Clark Shaughnessy, and George Allen, continued innovating the game all the way up to the 1960's with the T-Formation, defensive ingenuity and the use of game films. Notoriously tight-fisted, Halas is reported to have paid to send players through college, such as Dan Fortmann in dental school. He also reportedly paid all of Brian Piccolo's medical expenses following the player's losing battle with cancer. According to Jeff Davis' book Halas, the legend's life goal was to set his son "Mugs" up to control the team-so a Halas bloodline would always control the Bears. Mugs Halas died on December 16, 1979, at the age of 54. Following the senior Halas' death in 1983, Ed and Virginia (Halas) McCaskey and their family took control of the team and named their son Michael team president, a position he held until his ouster in 1999. Mugs' wife and children's shares of the Chicago Bears were sold in 1990 to Chicago businessmen Patrick Ryan and Andrew McKenna.